As hard as it may be to believe there was a time in music history when it was actually possible to be a regional star and nationally unknown. You have to remember that in the first half of the 20th Century people lived in caves and foraged for food. Humans weren’t content with being easy prey for dinosaurs however and by the 1940’s were using their one genetic advantage – the opposable thumb – to construct primitive tools along with the building blocks of our current language but had only gotten to J in the alphabet so their communication skills were pitiful. They were always musical though and I have it on good authority that they banged on rocks with mastodon bones when gathered around the fire to create rhythms to dance to. Suddenly out of the blue in the dark ages of 1947 came rock ‘n’ roll and with it we were introduced to science, modern medicine, air travel, television, bikini bathing suits and were finally able to complete the alphabet and play Scrabble. Dinosaurs were killed off in short order to have more room to build shopping centers and move to the suburbs which got people out of heavily congested regions so they could commute 45 miles to work in their spare time. Humans called this progress and we were all the better for it. Oh right, regional musical stars in ye olden days… in 1949. Music presumably had a leg up on such new innovations as TV, as radio had been playing music for years and records were available nationwide, but the club scene was still thriving in those days and clubs needed musicians to entice patrons to come in. 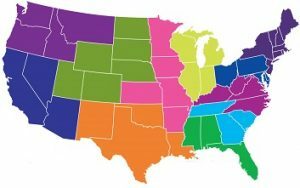 Since clubs weren’t seeking to attract people from across state lines or in another time zone, all they needed was a local act that was consistently solid musically and said act could theoretically reign supreme for weeks, months, sometimes years at one venue, or at least a succession of similar clubs in one area. It’s a topic we went into in some depth that with fellow Detroiter Todd Rhodes in the review for Sportree’s Jump back in November, 1947, but now here it is a year and a half later and Rhodes was a national name thanks to the A-side of that record (Blues For The Red Boy). His success would take him outside the city limits more and more as time went on. Now another pianist from Detroit was seeking to make the same jump from a solid club attraction to a national idol. Though T.J. Fowler never quite made it – at least not to the level that Rhodes would – that’s not to say he didn’t make a good go of it along the way truthfully, when seeing how the musical landscape has changed in those 18 months since Rhodes took his first steps towards a bigger stage and based on the sounds contained on the scintillating Red Hot Blues, you’d be excused if you stated that it would soon be T.J. Fowler who’d be the next big thing in rock ‘n’ roll. Fowler was originally from Georgia but moved to Michigan as a boy and later played the piano in his father’s pool hall, which is as good a school for the rock world as he could get, while his more ambitious musical aims were honed at the Detroit Conservatory Of Music. But Fowler was shaping up to be strictly a local act, highly regarded though he was in Detroit, at least until rock ‘n’ roll came along when he was in his mid-30’s and gave him the chance for some national renown. 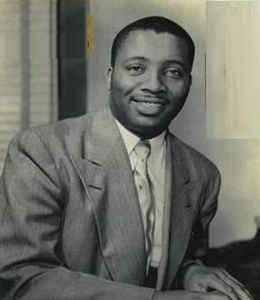 Having played around town with saxophonist Paul Williams it wasn’t surprising when Williams tapped Fowler to accompany him on his initial sides for the Savoy label, which included the first rock instrumental hit Thirty-Five Thirty in late 1947. That’s also when Fowler formed his own band and in 1948 cut some sides for local labels, including Sensation which is where Rhodes was recording. Maybe not wanting to have the sides competing against one another (or maybe being just clueless about the record business in general) they leased the best of these sides to National Records which is where we first encounter Fowler under his own name. 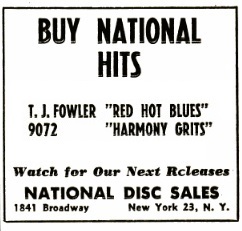 National must’ve thought they’d struck the mother lode when they got hold of Red Hot Blues, a record that was well named because this was as scorching a piece of wax as could be found. Whatever exotic locale your mind can conjure up in the late 1940’s – probably something half remembered from those Bob Hope/Bing Crosby “Road” pictures – this would be the soundtrack to that times ten. An Arabian dance-type sax line by Walter Cox opens this and right away you’re hooked. Riveted is more like it. This might just be the most evocative opening we’ve encountered to date in rock ‘n’ roll. It might not SOUND like rock ‘n’ roll but that’s okay because it doesn’t sound like anything else from this country either. Backed by a thrumming riff by the other horns (John Lawton on trumpet and Lee Gross on alto), this locks your focus until suddenly they all start taking off, horns flashing, two counter-riffs dueling it out, the underlying one sticking to a fast paced groove while Cox’s tenor sax shimmies on top under its own gyrating power. Now the pieces start to fall into place thanks to the ramping up of the excitement with its increased volume and frenzied nature of the playing – but sadly it’s where it also starts to fall apart… if only a little. The problem is the opening was SO captivating that once they depart from that tighter structure it comes across as chaotic. The thing about it is, it’s probably this way by design. That’s the whole point after all, the allegiance to the rowdy rock mindset where horns are supposed to seem out of control while the rhythm keeps you from slowing down enough to notice. All of that they do well even if the individual parts begin to lose their uniqueness. Make no mistake about it, the sound is still vibrant, the energy never lags for a second, but it’s in danger of becoming predictable. This is even more the case when the vocals enter as Fowler delivers some rote lyrics that could’ve been cribbed from any number of generic boogies of the past few years. It’s the one part of the record they probably felt was necessary to give it something familiar to anchor the performances but instead it weighs them down. When they launch into a call and response count-off – 1, 2… 3, 4… Red Hot… BLUES! – you fear the worst. That’s often the type of gimmick a band stuck for ideas throws in to convey a sense of anarchy their playing will be unable to live up to. No, not here at all. For what follows doesn’t only live up to the most outrageous playing you could conceive of, it may actually surpass it. Whatever the label says, T.J. Fowler is but an afterthought on his own record. It doesn’t mean he can’t play, it just means he doesn’t get a chance to because the horns don’t pause for so much as a second to let him slip in. The two saxes and the usually extraneous trumpet are bound and determined to out work, out sweat and outlast every musician stepping into the studio to lay down a rock record to date. There have been plenty of frantic performances released in rock already by the likes of Earl Bostic, Wild Bill Moore (on which Fowler played) and Big Jay McNeely to name just three but nothing heard so far was apt to cause cardiac arrest as much as what these guys are laying down here. It’s rock ‘n’ roll at warp speed, the brakes stripped off the roller coaster, the parachute cut from the back of those jumping out of the plane. The impact won’t kill you because your heart will choke you to death when it gets caught in your throat long before you crash. Whether this type of torrid performance was seen by other musicians as something to be admired, even if only for the sheer adrenaline rush it provides, or something to recoil away from in terror, the fact is Fowler and company were certainly not making the mistake that so many other would-be rockers did who got their first shot in a studio and promptly reverted back to something a little safer so as not to give the impression they were talent-less hacks who couldn’t play proper music. No, these guys seem to know the desultory fate of such timid records and are determined not to be lost in the shuffle themselves by toning things down, so instead they ramp everything up to eleven… or maybe twelve. Red Hot Blues might be TOO hot to be safely handled (in jukeboxes, on radio and even held in gloved hands by at home listeners) but it sure wasn’t going to be ignored. If you heard this just one time you’d never forget it, that much was assured. But what wasn’t assured was it connecting with enough listeners who weren’t frightened off by the cacophony of noise it contained to make the record a hit and to make Fowler more than just a regional name. The label was certainly potent enough to get it distributed nationwide, the title was in no way ambiguous about what awaited you if you played it, and the sounds that were in the process of ripping your speakers to shreds sure as hell weren’t going to be misconstrued by anybody who hadn’t gone deaf years before. This was rock ‘n’ roll to the extreme and the only question was would there be a market for something this over the top? The answer, as I suppose you can guess, was no. It wasn’t a hit. Clearly it deserved to be in the context of the rock sounds we’re in the midst of now and it would be hard to argue that this didn’t raise the bar considerably for what was acceptable and it would also be hard to argue that – as a record – it wasn’t among the absolute best of an increasingly crowded field. As exhilarating as it sounds, as effective as it is to wake the dead, it also may be a little TOO extreme. If you look at rock history the most frenzied sounds are not often the most accessible sounds. Punk rock had few actual hits because it required the listener to be in such a specific state of mind to appreciate it that it simply left most casual audiences feeling as if they’d been physically assaulted. A decade later the first appearances of gangsta rap suffered the same fate, being SO visceral in nature that the merely curious were often too afraid to strap themselves in and go on that ride. In music sometimes the smarter move is to dial it down just a bit. Rather than cranking the volume, the energy and the intensity to ten, leave it at an eight. You’ll still get the basic message across, still get enough of a reaction to leave an impression on all who hear it, but you ensure that they DO hear it, as in hear it all rather than turn it off. I don’t know if people did turn this off in horror back then, it more likely was a case of just slipping through the cracks – cracks that were still wide in a world not yet connected with instantaneous national feedback to give something like this a word of mouth buzz to grow quickly – but it’s not hard to understand why it missed. Whatever reason it actually was that caused it to miss, there were plenty of equally viable reasons to choose from. So in that spirit of dialing it down a few notches that’s what’ll happen in this review as well. For all of its bedlam there’s still just enough missing to have it not quite be transcendent. The best parts will always have you coming back for more, but it’ll take awhile before you recover enough to feel safe to play it again. Leave a reply on "T.J. Fowler: “Red Hot Blues”"